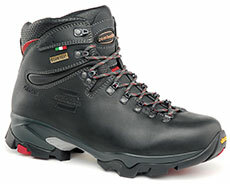 Zamberlan says:"The perfect boot for tough backpacking with heavy loads. The full grain leather upper with Hydrobloc treatment offers great climate control also with humid weather and the GORE-TEX Performance Comfort lining ensures waterproofness and breathability. The rocker profile and the FLEX SYSTEM junction on the ankle zone help the foot rolling while hiking. Excellent grip control thanks to the Zamberlan Vibram 3D outsole that is equipped also with an undercut heel for secure braking." The 996 VIOZ GTX from Italian company Zamberlan is a full leather walking boot aimed primarily at long distance trekkers and backpackers, and as soon as I took them out of the box and put them on I could tell I was dealing with a high quality piece of kit. The uppers are made from full-grain leather, enhanced with Zamberlan's proprietary Hydrobloc® treatment for added water resistance and durability over time. What is more, the main upper section is made from one single piece with the only stitching at the back and around the ankle to further restrict any opportunity for water ingress. I wear a 10½ and I found them to be extremely comfortable right from the get go. They felt very solid and well built and just oozed quality. If you have wider feet, there is a wider fit version which giver extra room around the front area of the boot up to size EE. The leather upper is enhanced with a Gore-Tex lining to help breathability and there is a Microtex® wicking nylon collar lining help control excess moisture around the ankle. and the Anatomical footbed is not only comfortable, but it also wicks away moisture. Trying them out on a rather damp and inclement walk in the Lake District bagging the newly reclassified Nuttall - Miller's Moss - I spent much of the climb wading through wet grass and ferns. Throughout, my feet remain perfectly dry and the boots stayed wonderfully waterproof. The Vibram® outsole of the Zamberlan 996 Vioz has deep wide lugs and this provided plenty of good grip as well as being easy to clean. This outsole is nice and thick, very stiff and there is very little lateral rotation and offered complete protection to my feet. The slightly curved shape meant I was walking with a gently rocking motion. This seemed a little strange at first but, once I had got used to it, seemed to aid forward movement. The ZFS (Zamberlan Flex System) is there to allow the boot to flex forward comfortably without compromising any lateral support and I found this to be both effective and comfortable. The lacing system has a standard locking lug at ankle height and them two more lugs to enable a nice and secure fit. The laces are plenty long enough so enable experimentation with all sorts of lacing techniques. Beautifully made, completely waterproof and stunningly comfortable - what is there not to like about the Zamberlan 996 VIOZ GTX Walking Boots? I suppose some might baulk at the price - but if you love walking and do quite a lot of it - treat yourself. You'll not regret it.